Caitlin Rose Fletcher has a phobia of pretty much everything. Ever since her mother disappeared four years ago, Caitlin has been been prone to severe, debilitating anxiety attacks at random. But then Caitlin and Jack learn that there have been mysterious sightings in graveyards in Scotland, Germany, Italy, and America. Something, or someone, seems to be rising from the graves, and if the clues are right, the next sighting may be near them. 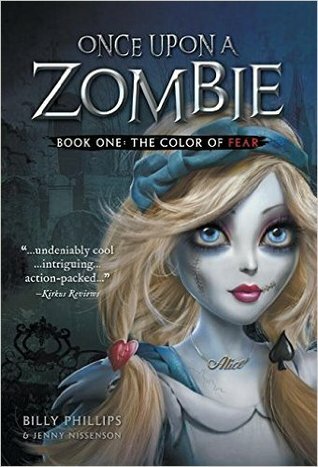 It’s on Halloween night when Caitlin gets tricked into climbing down a “rabbit hole” into a fairytale world…full of zombies. This little middle-reader story is definitely a fun and clever read. I loved Caitlin because she isn’t the heroine that you’re used to. She isn’t interested in doing anything heroic in the beginning. At all. But this is what makes her character arc so interesting. In this story we meet many familiar fairytale characters… zombified. Some terrible villain has zombified all the fairytale realms and it won’t be long before the subjects become mindless, flesh eating monsters. I really appreciated the lessons and themes that come through in this read. I am always on the look out for books that I can add to my middle-reader collection for my daughter, and this one had some excellent themes of adventure and courage. While there are many main characters from different fairytales, the overall theme is Alice in Wonderland. (setting, villains, guides etc) and since I just finished Alice, it was fun to pick up on all the Alice details in the story. Since it’s a middle-reader I feel like I should also mention the words “Hell” and “Damn” are used (once each), but otherwise quite age appropriate (fun zombie, not terrifying zombie) and really fun.